Iran's Persian Gulf Pro League side Zob Ahan SC have strengthened their offensive ranks with the signing of Nigeria national-teamer Osaguona Ighodaro. The 28-year-old has joined Zob Ahan SC on a free transfer and penned a deal for the remainder of the 2018-2019 campaign. Osaguona previously represented clubs in five different countries : Buffles Parakou (Benin), Shooting Stars and Enugu Rangers (Nigeria), Raja Casablanca (Morocco), KV Mechelen and Westerlo (Belgium) and Umm Salal (Qatar). 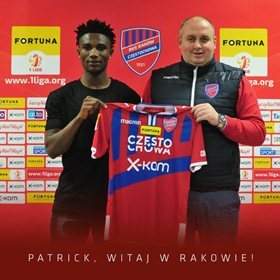 In another transfer news, Polish 1 Liga leaders Rakow Czestochowa announced this evening that Patrick Friday Eze has signed a contract with the club for half a year with an option to extend it by three years.